I feel slightly smug about reaching forty with #thesatsesh and I’d like to say a huge thank you if you’ve regular joined us. The clan is mainly hobby bloggers and I think I prefer the content as they usually have a clearer identity and passion for their chosen topic / theme or genre. I’m going to jump right into my chosen featured blogger today as her post made me laugh and frankly I agreed with many of the ideas she wrote about. She describes herself as a ‘Mum chirping away’ and I think this is why I adore her blog so much, its like having a chat with someone. Its my kinda ‘cup of tea and read’ blog. Empty Nest Mummy has written a post all about the things she would put in Room 101. I use to watch the TV programme as a teenager and love the concept that you can throw things in there and then never have to deal with them again. I think the first thing I’ get rid of is ‘adulting’ although technically that not even a word, let alone an object. She threw Croc’s in there – they are the plastic equivalent of hell and I don’t understand why people need ‘garden shoes’ or subject their children to them. She also added Cats bums (I totally agree) and upward inflections (with you again), however I don’t think a sunday roast would be joyful without gravy, so I’d save that and also am a butterfly and bug kind of chick….anyway, read it yourself by clicking the link above. Her talent for honesty and humour makes for a joyful read. Hayley as always has picked her featured blogger – click here to see who she has picked. 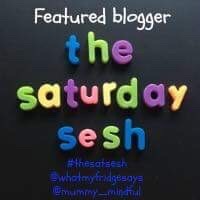 Again, another talented blogger who I’ve adored working with over the last year on #thesatsesh , now read the rules below, click the blue box and join our lovely linky community – please advertise this to blogging friends and we are always appreciative of new bloggers (experienced or not) coming to play. I was looking at the Mr today and thought ‘he’s a keeper’ and realised that this quote truly summed up how I felt. So this post is all about gratitude for the relationships I already have. I often think about what I want for the future and always slide into the trap of reflecting on what I lack, but Js Daddy and my Mr F is a non negotiable. My son is equally amazing but also (only I and the Mr can say this – anyone else who dared would feel my wrath) and absolute w*nk*r. Seriously, he is five years old and can go from a cute an angelic over achiever to a whinging douche bag faster than the speed of light. I really love him though, less so at dinner when he takes 5 hours to eat his meal due to procrastinating and sharing every fact he has ever learnt to anyone that will listen. I did worry when I was pregnant with him that I might not like him. Luckily Mother Nature throws more than enough love between a mother and child moments after birth that lasts you a life time. Both my boys have helped me to flourish, dared me to dream and supported me when I’ve taken on new adventures. The Mr is a great sounding board and is one of those really annoying humans that is always right, which in the moment is infuriating but with age I’ve learnt to listen to him more and he is a wonderful team member, he also has other skills like taking the bins out and fixing stuff that is beyond my realms of interest. I mean, if thats not romance what is? The other night we were in bed and I said something about how we had basically had a ten year sleepover, whilst reading his book he muttered “the snacks are naff” and we both burst out laughing. We laugh a lot, usually at my expense, or at dogs on YouTube, or at our little dude making sense of the world around him. I never take it for granted though. Anyway, rather than read my rambling thoughts on the boys in my life, perhaps take some time this week to think about who you are blessed to have in your universe. Not in a Hallmark cards way (those quotes never inspire me), or in a list of what they do for you way, instead I urge you to think about how they make you feel because stirring those emotions is the essence of tomorrows relationships and having a tribe that works for you, that completes your puzzle or that helps you to come construct a better puzzle for the future is worth its weight in Halloumi (I prefer Halloumi to Gold). Love hard and stay true to yourself. Welcome to another successful week of #thesatsesh linky. This week for me was a slow start (seriously Tuesday felt like Thursday) but then whoosh and I find myself sitting here and typing the new weeks linky up. I hit an all time high this morning, woke up buzzing, for absolutely no reason what so ever and decided to stay here. Although this is now enhanced by a glass of wine, the weekend has arrived and I’m feeling great. I hope you are too. I had a very funny encounter with a click and collect deliver man called Mark today – he was super grumpy and even though I was a happy customer he was sad for me at every opportunity. I paid extra for bags as I picked the large food shop up alone, half way through the shop the bags disappeared, Mark blamed the lazy packers. He then showed me my substitutions – I was happy with them, except the Halloumi, Feta isn’t the same thing? Anyway, Mark was outraged. So I changed the subject by noting the lovely sunny weather – Mark noted the high UV glare and I Couldn’t help but chuckle at his disposition. If you loved my featured post as much as me, please leave her a lovely comment and use the hashtag #thesatsesh in the comment box. Or you could check out who Hayley has picked for her featured blogger by clicking here. The text above made the hairs on my neck stand on end. Truth can do that, it can cut through your soul and not leave a trace that’s it’s obliterated your very being. I pondered on happiness to raise my self out of a potential pit of sadness and then I decided to do what I always do when my world looks like it might turn sour or the weight of the day has left me feeling empty – Make a mental gratitude list. The list usually works like a magic spell to lift my spirit and redirect my day. However, I then realised something that for me felt profound. Although I relish the time I have alone (like now laid on the bed with a cup of chamomile tea and a candle for company #gangsta) all the moments of happiness I have usually involve sharing it with other people. My son came home from a new Tennis club beaming today, he couldn’t wait to tell me what he had achieved. My happiness soared just hearing about his adventure. New purchases don’t feel fun until you show others or they compliment, or ask where you got it from. My tribe is the basis for most of my drops of happiness, but retelling and sharing moments is often the best bit. I don’t think you can experience the true power of happiness alone. Do you? Perhaps you share a moment through social media or even with a pet (seriously my dog laughs at all my jokes), you send a postcard, letter or email. The only way I can think that not sharing can be more fun is when you eat an entire bag of share sized crisps to yourself. Being mentally healthy really is everything, if you are blessed with a serotonin, dopamine, norepinephrine and epinephrine mix that’s good, or even better if you are mentally better by 1% then you were yesterday – you’re blessed. If you have someone (anyone…could be a pet) to share any more plus percentages with, then you’ve made it. I had a little treat today, one of my old pupils came to see me, she’s 22 years old now but forever 16 in my mind. She entered pushing a push chair and with another on the way. Luckily she was always crazy, so she’ll excel with two under two years old. It was such a blessing to hear about her career and how her and her partner have recently got a mortgage and settled. It was lovely to see her ‘Mummying’ like a legend. She always made me proud. This leads me beautifully on to my featured blogger, the theme of her post is gratitude and reflection as she looks back at what the month of May held for her and her family. Helena from The Queen of collage monthly round up was a lovely way to look back at what her family had got up to. The longer I blog the more I find myself writing about my tribe, not necessarily for the readers but as a way to keep our family memories alive. Helena is obviously a devoted Mumma, but also a creative chick with a flare for detail. If you don’t follow her, haven’t read her posts or are looking to blend creativity with parenting – this writer is for you. Please use the link above to check her out. She deserves the love. Quote Anon, but I think most humans at various parts of their lives have probably thought something similar. The original computers were based on human brains, designed by human brains and so its no surprises that our lives often become endless array of tabs open, just like a busy computer. My current mind is whirling since I just put my son to sleep (I say down he is currently chatting to himself and showing no sign of slumber) I’ve got parent tab bars open, work deadlines and things I need to do for tomorrow, the new shoes that I’m watching, childcare arrangements I need to make for the week ahead, goals for the future, chores to do – these fall into several tabs alone – some I need to do, desire to do and if time slows down some I might actually achieve. Its no surprise that the modern worlds demand and if I’m honest the demands that I put upon myself (see chore tab bars) often seem relentless and never ending. 2). Keep a balance on the tab’s of life – reduce where needed, or perhaps even take a holiday to escape the everyday demand of tab bars. Warning: body pressures on holiday, safety when abroad, travelling with kids, financing the holiday and the washing when you return can lead to more tab’s being open. 3). Stop and reduce the tab’s. I personally favour the third option and do this through meditation. Something I need to make more time for daily. *blog about how I’m going to achieve that coming soon. However, what I’d like to share with you today is a mini journey I’m taking with my son. J is five, he attends school and is in Reception, hates the academic aspects of school life and loves the sandpit. We are currently working to improve his handwriting, confidence with his fine motor skills and making sure we all don’t loose the will to live in the process. Its hard. Then a couple of weeks a go I watched a programme where children with ADHD were encouraged to meditate and it even enabled the parents that invested the time on meditating to stop using medication. As I was watching it I thought, why aren’t I doing this with my son? He knows that both of his parents meditate, he even sometimes watches, I teach kids at school but I’ve never taught him? We are hoping that its a tool that he can use, just like riding his bike or swimming and reading. The bonus is if it helps him at school or when he finds too many tab bars open in his mind. If you’ve ever spent more than five minutes with a five year old boy then you’ll know that tabs pop up frequently; questions, answers, facts on dinosaurs, what we are doing tomorrow, what we are having for lunch? when its snack time? where is Daddy? …anything involving toilet humour, star wars, phonics…the tabs are endless and currently lack any filter. We began small with a 2 minute meditation, I did some research using real tab bars and found out that children respond best with guided meditations that you use repetitively (there is comfort in ‘knowing what comes next’ for little dudes) and also not spoken by someone that they know AKA Mummy. I found a quiet space, invited him to join me, role modelled the process and with my eyes slightly open to peer on the little munchkin watched him roll around the room, flip backwards, pop his feet over his head and move faster than any olympic athlete. It was a huge wake up call for me. I knew he was a boy full of beans but I’d underestimated how hard he would struggle. Result: Surprisingly he loved it? We did it again…similar outcome, he enjoyed it but the progress was minimal. I knew I’d need some patience, but we increased the session to twice a day for just two to three minutes. Then I was listening to Aaron Doughty on youtube (easy on the eye and brings the healing world an the science world together) and he mentioned that when he meditates he uses a candle. It helps as the mind focus’s on the flame. Lets give it a go I thought, what can go wrong with a five year old and a live flame? As it turns out – nothing. I edited our practice slightly and we both sat with our eyes open. I reminded him that fire was hot and not to touch it. He sat still and was mesmerised. After a minute in to our practise he whispered “Mummy can I blow the flame out at the end?” I smiled and nodded that he could. At the end he beamed up at me and I said “now you can” and frankly every session ends with a birthday cake celebration, we both even clap. Like I said this is just the beginning of our journey, he doesn’t always want to do it but I remind him its important, just like brushing our teeth is. We have a way to go, increasing the time, the wiggles and at some point closing our eyes, but its a start. If you have any tips for meditating, please share below what worked for you?